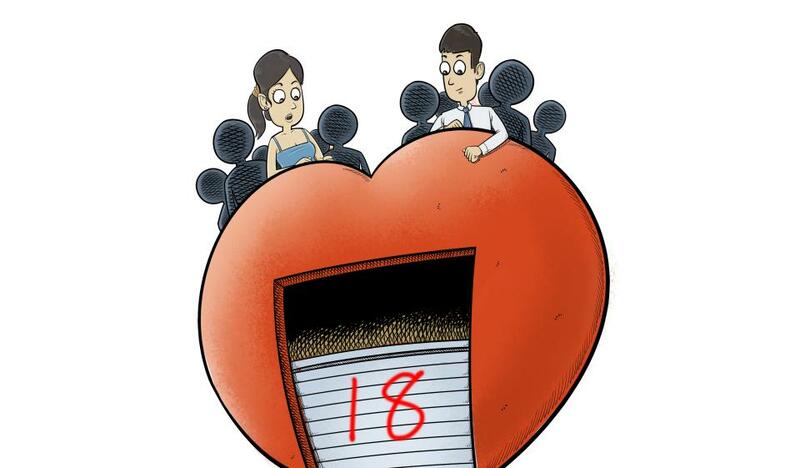 Huang Xihua, representative to the National People’s Congress, proposed that the legal age of marriage in China should be reduced to 18, reported Guangdong-based newspaper Southern Metropolis Daily. Her suggestion rekindles a debate on whether the marriage age should be lowered. The current marriage age in China is 22 for men and 20 for women, a relatively young age, according to commentator Chen Zexiu, writing for financial news site Caijing. But it's not the same case internationally; a statistical study on the legal ages of marriage in 108 countries by an unnamed expert found that about 70 percent of the countries set the age at 18. People who endorse the representative’s proposal believe that adults – people of no less than 18 years – should have their freedom of choice. “Since an 18-year-old person is an adult with full capacity for civil conduct… then how come he or she isn’t allowed to marry at this age?” Chen cited population expert He Yafu, who wrote an article on the issue. Moreover, the phenomenon of people marrying before reaching the statutory age is not uncommon in less-developed parts of China. Therefore, lowering the marriage age is, in effect, protecting their marriages and rights. And “females and males are sexually mature at 14 and 16 years old,” the commentator also cited Huang as saying. So there is another six years to go before the already sexually mature youngsters reach the marriage age, which, according to the commentator, can cause certain social problems. But critics contend that with such a low marriage age, more social problems will arise. For one thing, although legally counted as adults, an 18-year-old could, due to an indulgent upbringing, be like a “child” dependent on parents. Even if he or she can take responsibility for him or herself, that doesn’t necessarily mean he or she can look after spouse and children, possibly resulting in an increasing divorce rate. Countering the advocates’ argument that lowering the age can help implement the universal two-child policy, critics contend that what prevents couples from having children is not the age policy, but economic conditions, social stresses and other factors. It’s unwise to use a younger marriage age to counter population aging, as a series of negative effects might arise instead.